So right now, I’m sitting in the front passenger seat of my 12-person van. The entire family – eight kids and my wife and I – are traveling down Interstate 80 East about an hour outside of Salt Lake City on our way to Denver from the Sillycon Valley, CA. We’ve been driving since 8:30 last night. I took the first shift, which lasted a little more than eight hours. I dig driving down the highway, listening to tunes, or just making up songs in my head. About a week ago, I was dreading going on this trip because I had a really tight deadline, and was stressed out about leaving town. And even though this was going to be a half-working, half-fun vacation, I didn’t want to leave town and leave my team hanging. But I finished the major pieces of the project from my end, and all that’s left are some niggling details that are dependent upon other team members, so I can get online Monday and stitch everything together. Getting my stuff done yesterday took a HUGE weight off my shoulders, and when I got home to pack up the van, I was jazzed to go drivin’! Taking a road trip has always been a boon for making music. I only take my acoustic with me, and spend my free time wherever we might stay, just sitting back and playing. It’s that aimless, musical meandering that has given me some of my best ideas. But I don’t woodshed on these trips. The point is to break the routine and simply enjoy. If an idea comes to me, great. If not, I’ll just play from my wide repertoire of cover songs. But the point is to play. Of course, since I’m on a “working” vacation, I don’t really have as much time to play as I’d like, but with the time I have, it’ll be spent sipping a cold one with my wife and/or eldest son, and enjoying life; playing guitar just for the joy of it. Doing just that helps to remind me of why I play guitar and perform in the first place. With as many gigs I do each year, it’s easy to lose sight of why I do it. Yeah, the money’s great, and I get paid pretty well for being somewhat of an “unknown.” But more importantly, I play simply because I love to play, and trips such as the one I’m on right now help me remember that. If you’re in music or aspiring to be in the music biz and you’re not reading the “Lefsetz Letter,” you should. It’s free. Sign up at lefsetz.com to receive Bob’s posts in your inbox. After so many years writing about the music industry, Bob’s hooked up, and so many of observations are so spot-on, it’s a little scary. And isn’t it interesting that the people who say they won’t quit do, and those who continue keepin’ on just do so silently. Perseverance is a skill, too often untaught in today’s instant gratification world. Greatness comes from frustration. If you haven’t lost sight of the destination, you’re on the wrong road. Those last two lines sum it all up for me and my own life. As a musician, I’ve experienced some great success – albeit local. But where I’ve really experienced success is in my career as a software engineer. Somewhere along the line, while I didn’t lose my passion for making music, I developed a passion for creating great software. Look, I think about music 24/7. I’ve always got tune ideas going through my head. But in a way, I’ve lost my way in my musical journey. I know that I could perhaps get lucky with one of my or maybe even some of my songs, but realistically, I don’t put enough time into getting my music out there so it can be discovered. I post it where I post it, and if people discover it, great. And I’m okay with that. On the other hand, I’ve built a solid career in software engineering, and to me, as far as that’s concerned, the sky’s the limit. No, I haven’t settled with respect to my music. I just got sidetracked a bit. Moreover, doing music has never been about getting a record contract for me. It has always been about performing and playing. You see, I haven’t given up on music at all. I’ve just adjusted my delivery. Okay… I’m feeling a little guilty… I’ve had this pedal for review in my possession for months, sent to me by Peterson Tuners, who’s the US representative for Sonuus. It’s not that I didn’t want to review it, but when I got the pedal, it was before I got my hip replaced, and in the few months leading up to my surgery, I was always in way too much pain. But now that I’m healing up, I finally opened the box to give this pedal a try. First of all, this pedal is just dang cool! It has the ability to produce virtually any wah/filter sound you can think of. 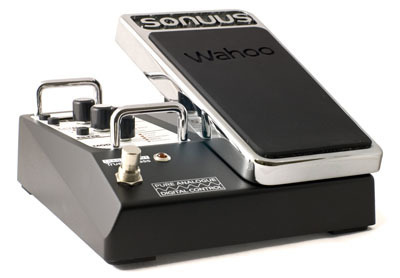 The sweep of the expression pedal is super-wide, which is something I dig – especially in wah mode – because it allows me to add subtle to dramatic sweeps. Then the filter stuff takes this pedal way over the top, giving you the ability to make very cool vowel sounds to even flute sounds – yes flute (albeit synthesized, but it’s still cool). Admittedly, I was a little overwhelmed and intimidated by the pedal when I first started playing with it. The thought that crossed my mind was, “Dang, if I want to create a different sound, do I have to continually tweak parameters?” That usually drives me away from high-tech gadgets because I just don’t have the time to mess around. Luckily, I had an “RTFM” moment, and picked up the manual. Turns out that there are 100 presets on the pedal, so it was a simple matter of finding presents that I liked and remembering them. But the pedal also allows you to edit the preset, so if a preset needs to be tweaked, it’s a simple matter of making your adjustments, then holding down the “Save” button for a couple of seconds. I’m still playing with the pedal, so a review is pending. But what I’ve discovered in the hour or so I’ve played around with the Wahoo has really impressed me. I especially dug preset 78, which employs what seems like a high-pass filter that produces a haunting flute sound. But thus far, I’m having fun just discovering the different sounds the presets make. Stay tuned for a full review with sound clips! For more information, visit the Wahoo product page! I’ve been playing this amp A LOT since I got that RocknStompn power strip that has great filters, keeping the amp dead quiet. But after playing it straight for the last few weeks, I’ve taken some notes about playing. First of all, as I entitled this article, you can run all you like, but you can’t hide with this amp. It has such a fast attack, that any mistake you make will be picked up. On top of that, it has no tone stack, though it’s voiced in the upper mid-range by nature of its diminutive speaker, so you cut right through a mix, and even though the volume might be low, the frequency range will pretty much guarantee you’ll be heard, mistakes and all. 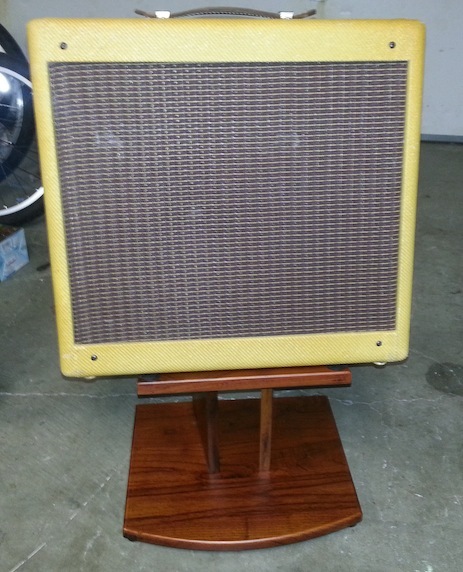 Even with the 10″ speaker I have in the custom cab, the amp’s tone is still bright. The other thing about this amp is that it’s VERY difficult to overdrive. Even at 5 watts, I have to use lots of input gain to get the amp to break up. That’s not a bad thing because it makes the amp perfect as a pedal platform. 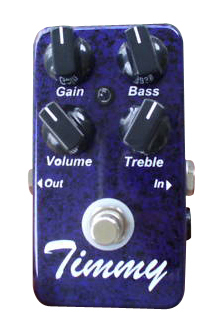 I use my Timmy in front of it, and even though it does add a bit of sustain, the amp’s tone is still raw. And even with the tube rectifier, you’d think you could take advantage of the sag for a little sustain, but no dice. You stop playing, and the amp stops making sound – instantly. But despite that in-your-face, fast attack, and zero sustain, that amp has forced me to take my time with my playing and more importantly, try to squeeze out as much tone out of every note that I play. In a very real way, the amp has helped me improve my expression. For instance, I took the amp to my weekly church gig yesterday along with my Les Paul R8. During rehearsal, we played a song I just wrote yesterday, that was a real prayerful piece. Since we had lots of other guitars yesterday, I was able to focus mainly on playing solos or little call and response runs against the lines of the verses. What struck me was the sustain that I was getting out of my notes. Even though I had brought a reverb pedal, I wasn’t using it in the song. I relied entirely on my fingers to squeeze out as much sustain as I could. Especially in the solo break, it sounded like a Hawaiian slack key or pedal steel. My bandmates remarked on how good it sounded. I just said thanks but in the back of my mind I was thinking that the Champ really made me work harder. Mind you, working harder is NOT a negative in any sense. I should probably rephrase and say that it inspired me to work harder because I knew that I didn’t have a leg to stand on with sustain – I had to produce it myself. And I think that’s sort of the crux of my latest bare-bones approach to playing. It makes me work a lot harder to express myself. In the very early days of this blog, I wrote an article called “Fighting with my guitars…” where I talked about not changing my strings that often because the used strings made me work hard to squeeze out as much tone as I could. I change strings a bit more often now, but it’s not a regular thing by any means. I like the tension of fighting a bit with my gear. If it was completely effortless, I might get bored pretty fast. Okay… What the F$%K are the Stones Doing? I followed a link to an article from a digest post from my favorite music industry curmudgeon Bob Lefsetz this morning that literally made me shiver in disgust. The article discussed, or more accurately, panned Taylor Swift singing the classic “As Tears Go By” with Mick at a Stones concert in Chicago. Curious, I watched the video, and when she started singing and prancing around the stage like a little fairy princess, I shuddered. The original recording was so melancholy and introspective, and was one of my favorite Stones tunes. But Taylor Swift completely butchered the song, singing it as if it was some cutesy kids tune. Then doing her little pop diva arms and doing a little dance with Mick made me absolutely cringe. It’s sad to see the Stones have to resort to antics like this: Bringing pop divas on stage like Taylor Swift who completely butcher a song by not feeling it nor understanding anything about where the song is coming from. I’m not especially a fan of Ms. Swift, and by no means do I begrudge her professional success, but she did a disservice to the Stones with that performance. She’s a professional for goodness’ sake – she should know better. But the Stones continue to do a disservice to their fans by doing things like this, or charging $600 a ticket for their concerts. Downward spiral indeed. They’re starting to look and act like a real-life Spinal Tap. Such a shame. Today was my kids’ last day of school at the parochial school they attend, so two of my close cohorts and I played the end-of-school Mass to rock it up one last time before the summer. The Mass was scheduled to start promptly at 8:30am, and I had a meeting at work at 10am, so I decided to keep it simple and bring a fairly sparse rig to the service. Normally, I use either my DV Mark Little 40 or one of my Aracom VRX amps (18 or 22). But today, I wanted a combo, so I brought my original 1958 Fender Champ, and my nano pedal board which just had a tuner, overdrive, chorus and reverb. 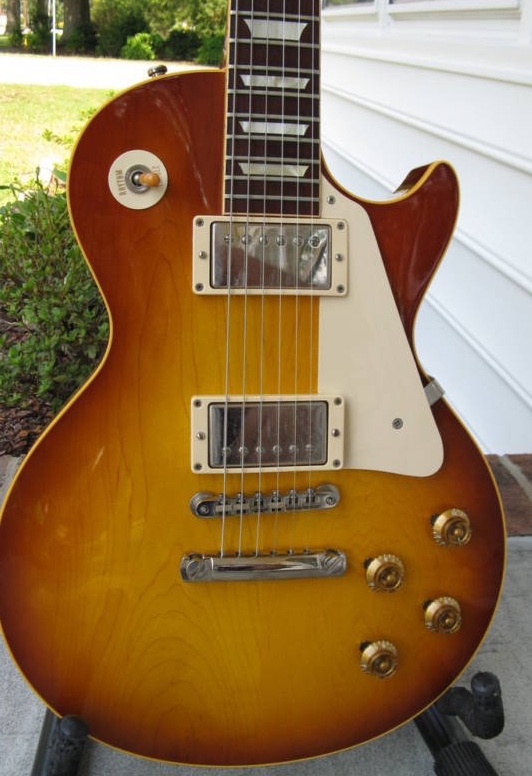 Since I hadn’t hadn’t gigged with her in awhile, I decided to bring “Amber,” my ’58 Les Paul Standard Re-issue. About 7am, I loaded up my gear into the car, and headed out to the church. 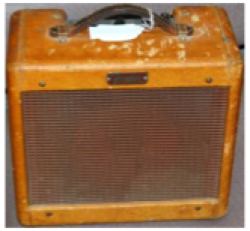 When I got there and opened up my trunk, I realized that I hadn’t strapped my pedal board to my gig bag, so I did that; pulled out my amp and cord bag, closed the tailgate, turned around to head to the church, then heard a crash behind me. Yikes! I apparently didn’t snap the buckle to the pedalboard’s strap well enough. Oh well… I figured the case was padded, so no harm, no foul. Once I got into the church, I immediately set up my rig. Once everything was copacetic, I switched on my power strip, and was shocked to see that none of my pedals were switched on! I was using a 1-Spot for this little board because it’s so convenient. I’d had a connector string go out on me once, and always keep a spare in my cord bag. So I unplugged the 1-Spot adapter from the connector string, and plugged it into one of my pedals, and immediately my heart sank as that pedal didn’t power on. I tried it on another pedal and got the same thing: NOTHING! Well, not one to panic, I knew that all I _really_ needed was some dirt at times because the Champ doesn’t break up so easily, so I pulled my Timmy off the board, put the board away, then hooked my cables to the pedal. I had a fresh battery in the Timmy so I knew I could use it. We started rehearsing once I had everything squared away, and the sound that was issuing from the amp was pure ear-candy. Normally I like to grease up my tone with a little reverb and a touch of chorus, but the tone was sounding so good, I didn’t miss it at all. When I needed dirt, the Timmy gave me the snarling dog grit that I love to hear with my Les Pauls. Add to that the natural sustain of my R8, and it was a purely inspirational experience! Because we were playing a church service, I had to play a both clean and dirty, sometimes within the same song, but I didn’t need any effect support other than my Timmy. As far as cleans were concerned, I had forgotten how incredible the Champ sounds clean; especially when my Les Paul was hooked up to it. In a previous article, I mentioned that I hadn’t played my Champ in awhile because it would hum after about a 1/2 hour of playing. That changed once I got the RocknStompn power strip. No, this isn’t an ad for that. It’s just that that one component provides such great power signal filtering that I find myself going to that amp almost automatically now because its sound is so magical, and powered by the RocknStompn, it’s DEAD QUIET! I think what I needed today was just a dose of tonal purity, stripped down bare, with nothing to hide. Like Japanese art, there’s beauty in simplicity as the simplicity conveys the essence of the art, unencumbered by ancillary or unnecessary adornments that could detract from the pure essence. That’s what it felt like this morning. Pure. Essential. It was amazing. My right-hand man in the band remarked after we finished rehearsing a song that I sounded like I was channeling Jeff Beck. I smiled and thanked him for the compliment, though in the back of my mind I was saying comparing my playing to Beck’s is like comparing a Pinto to a Maybach. But it did get me thinking that other than the occasional use of delay, Jeff Beck’s sound is pure. He has some other effects, but mostly it’s just his guitar and amp. Simple. Admittedly, I had to work the strings a little more to coax as much sustain out of them as possible. But that was undeniably a good thing because it made my playing so much more expressive. I didn’t rely on any speed – gawd knows I’m not that fast. But when I soloed, I took my time, and let my notes breathe because I knew in the back of my mind that I didn’t have anything to help me with sustain. It was just me and the guitar. A guy I know, Anthony Bonadio, who owns Reason Amps, once told me that all he uses is a booster pedal. I never really got that until today. I realize that all this might sound old-hat to many, and I’ve spoken about this in the past. But the experiences in the past didn’t hit me like it hit me this morning. Purity definitely has its place, and simple is good. Now this doesn’t mean I’m going to sell off my entire pedal collection. 🙂 But I think I’m going to take the approach of starting out simple first, then adding effects as I need them. For so long I’ve had some pedals on all the time. I’m going to shut them off and let my fingers do the talking.